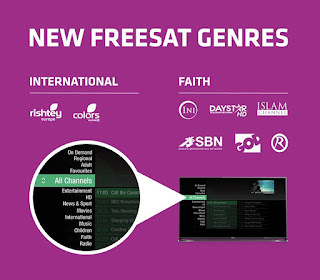 Freesat has announced new genres for its EPG, with the addition of Faith and International sections. Additionally, Irish TV, Forces TV and the Community Channel have been reassigned to the Entertainment section of the Electronic Programme Guide, which sees the channels tagged on behind Blaze in the channel list, taking channels 163-165 from today. Rishtey and Colors head up the new International genre, available from 630. The changes follow the gradual dismantling of the lifestyle section in the 400s which only had one channel - Irish TV - in the end. Community Channel's move to Freesat 164 in the Entertainment section follows a similar move on Freeview a few years back when it was reclassified as a general entertainment channel.